The sixth generation of one of the most charismatic sport-tourism market models comes loaded with technology and sportiness, twelve years after its last renovation. The darling of Honda is modernized without losing the hallmarks that make it unique. Who does not know the Honda VFR? One of the oldest and transcendental models of modern history has marked the development of the sport concept since its inception back in 1986. 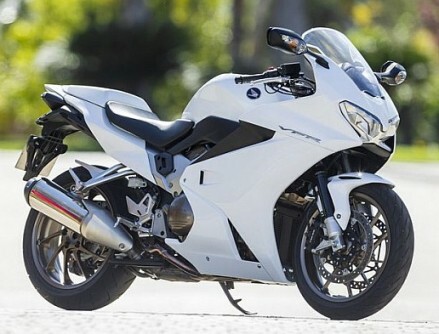 Its aluminum chassis, elegant but sporty presence and the swingarm has been characteristic elements since 199. But above all, its heart V4 (now with 782 cc) has always been the highlight, technology house mark in competition from the NR500 of 1979 and across the street from the VF750 custom of 1982. Only Aprilia RSV4/Tuono maintains this mechanical configuration today. The 2014 Honda VFR800F is more stylized, has a sophisticated LED optical front (whose design is reminiscent of the Ducati Panigale), with auto-off intermittent narrower fairing, 7 kg less (now 242 kg in running order), improved ergonomics (adjustable 2 cm seat in height and handlebar in distance), ABS, traction control system (TCS) and heated grips as standard. The 43mm fork is also new and even ventures into a radial calipers (Tokico) and optional semi-automatic change quicksifter (€300) for those wishing to explore their side more “racing” (upload speed without touching Clutch and operates from 1,500 rpm). The circular chrome and black logo which looks generous fuel tank of 21.5 liters indicates that this is a “Honda premium” for the cheapest brand models only carry sticker. The bike is closer, especially since the previous radiator dual side has given way to one forward conventional. The commissioning of the VTEC system (from 6,500 rpm engine goes to work two to four valves) results in a roar accompanied by increased acceleration. That transition is now almost imperceptible, much more successful than the previous model. Here VFR changes character and encouraged more, but without excess. A dynamic level the VFR is the same height as the engine and to this end continues to maintain a double beam aluminum pivotless chassis now 2 kg lighter and escape completely redesigned with access to the right side instead of the two escapes under the tail of yesteryear. This change will 5kg lighten, besides achieving better mass centralization, which is evident in the changes of direction. The VFR is not as agile as a CBR600RR but serves notice to any twisty section. The suspension also has fault. In this case there is no lack inverted fork, as the Showa 43mm is so robust and well adjusted will not miss anything. For driving with passenger, the remote control of preload on the rear shock (with gas cylinder and linkage) after the left rear footpeg stay will come in pearl to adjust the “weight transfer”. At no time noticed activation traction control, except when caused the wheel slip on zebra crossings. Not the same and acts the crosstourer retarding the ignition when it detects a gap in the wheel spin. For €13,499 you can enjoy of better sport-tourism of average cylinder capacity of the market, a machine with a lot of history and little competition. With 106 hp and ability to mount bags, the VFR is still a wonder now what to engine performance is concerned with a ‘VTEC transition’ much more enjoyable. A classy bike, good “foundation” and conveniently adapted to the times. The smoothness of operation, total absence of vibration and light touch will conquer: a universal bike with personality and years of experience. In fact, this model has not inherited the automatic transmission-sequential DTC of the VFR1200F/Crosstourer/Crossrunner/NC’s, unmistakable sign that have been bet by the sensations of “piloting”: 100% enjoyment for biker.